Giving Nature a Home in Glasgow The Glasgow Wildlife Garden Festival 2018 is almost upon us! From Springburn Park to Victoria Park, Garnethill to Lambhill: there are dozens of events running across Glasgow this spring to celebrate the city's amazing wildlife and greenspaces! The main events for the Glasgow Wildlife Garden Festival start on May 12 and run over each weekend until June 3 at sites around Glasgow. Each Saturday and Sunday will see the festival focus on a different area of Glasgow east 12-13 May, west 19-20 May, south 26-27 May and north 2-3 June. Festival leaflets, with amazing artwork by Stuart Hatt, will also be available next week at various venues around the city, including the Kelvingrove Art Gallery and Museum. 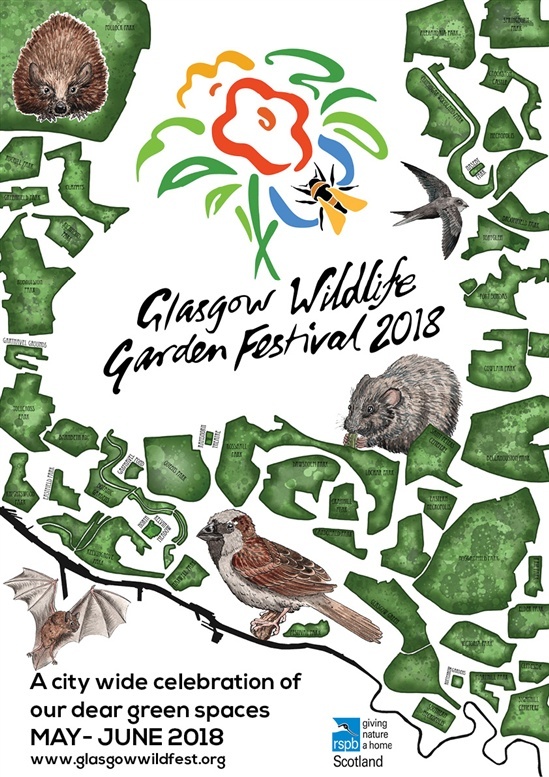 This year’s Glasgow Wildlife Garden Festival is a celebration of both the city’s remarkable wildlife and greenspaces, and the 30th anniversary of the Glasgow Garden Festival, which of course ran in the summer of 1988. Now in it’s fifth year, the Glasgow Wildlife Garden Festival is part of Giving Nature a Home in Glasgow, an RSPB Scotland initiative. It is aimed at connecting schools and communities with their local green spaces and celebrating the many organisations and groups working to help make Glasgow a greener city. It’s a collaborative effort between RSPB Scotland and Glasgow City Council. More information can be found at www.glasgowwildfest.org. For more information contact gnahg@rspb.org.uk, tweet @RSPBGlasgow or phone 0141 331 0993.